An Imagekind Paper Sample Kit allows you to inspect the diversity of our paper and canvas selection before you decide on a substrate. We offer eight different fine art paper types and two different fine art canvas options for our giclee prints. When you purchase an Imagekind Sample Kit for yourself or a client, you’ll understand how we’ve built a reputation as the industry’s foremost artistic quality and choice leader. 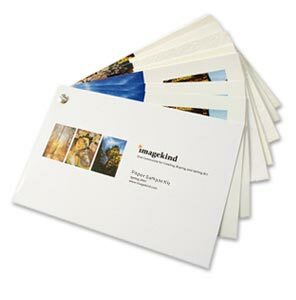 As further incentive to buy, the Imagekind Paper Sample Kit pays for itself. Shipped free of charge, the Sample Kit comes with a coupon worth $15 off of your next order. If you want to learn more about the choices you have when choosing to print on all of our fine art paper and canvas options, you can read about them on our Fine Art Prints and Posters page and our Fine Art Canvas page. The same printing system we make available to online shoppers is commonly found in museums, art galleries, and photographic galleries. Using the new Ultra-Chrome K3 pigmented inkset, from Epson, our fine art printers will allow users to print outstanding color and neutral black & white prints on a variety of media including glossy, satin, matte, fine art and canvas. The beauty and brilliance of a pigment giclee on canvas, watercolor or satin paper is unparalleled. Fortunately, they&apos;re made to last too! The Epson system of inks and paper have received lightfast permanence ratings from the Wilhelm Research Institute that well exceed 100 yrs (with proper UV protection), so you can be assured that your prints will look just as good in 30 years as they do today.